the ground is silver. The 1st wall is silver. there is a woman 3 feet in front of the 1st wall. the 2nd wall is 4 feet left of the woman. It is facing the woman. the 2nd wall is silver. The woman is facing the 1st wall. There is a black illuminator under the bottom of the woman. 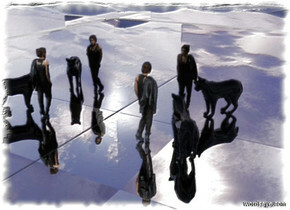 There is a black cat on the right side of the woman. It is facing the 1st wall. It is 30% transparent. It is night. There is a crystal. There is a tiny cyan illuminator above the crystal. There is a tiny blue illuminator in front of the crystal. The ground is shiny. There is a transparent waterfall behind the crystal. 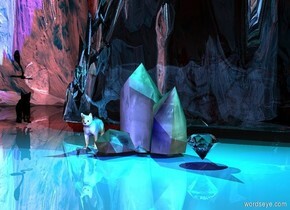 There is a tiny white cat on the left of the crystal. There is a big diamond on the right and in front of the crystal. There is a small cyan illuminator above the diamond. There is a small black cat on the left of the waterfall. 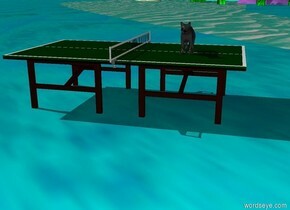 The black cat is facing the white cat. There is a huge dark red illuminator behind and above the black cat. There is a small red illuminator in front of the black cat. There is a very tiny black snake three inch above the black cat. 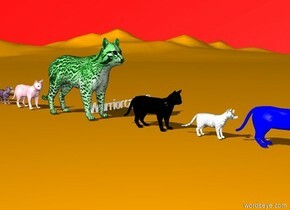 The snake is facing the white cat. There is a small black illuminator on the left of the snake. A 1st pink cube is 200 inch wide and 200 inches tall. 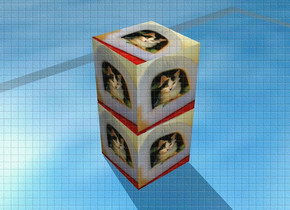 A 2nd rainbow cube is 200 inches wide and 200 inches tall. The 2nd rainbow cube is 200 inches to the right of the 1st pink cube. A 150 inch tall television is on top of the 1st pink cube. The television is facing east. 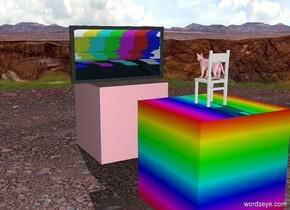 A 100 inch tall white wooden chair is on top of the 2nd rainbow cube. 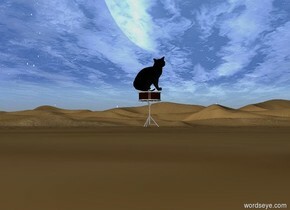 A 45 inch tall pink cat is on top of the white wooden chair. The white wooden chair is facing the west. The pink cat is facing the west. small green cube is on red glass disk. near red disk is orange disk. little blue-violet cat is on this orange disk. tiny blue bottle is on top of green cube. small wood bottle is in front of cat. very little red gas mask is on top of wood bottle. The dog is facing on the cat. The cat is facing on the dog. The ground is purple and shiny. 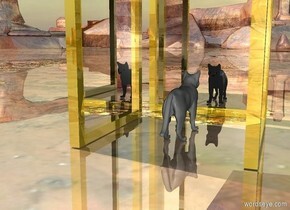 There is a huge gold cube one foot behind the dog and the cat. How many cats do you count? there is a white computer on a [wood] desk. its push button is white. its button is white. its trackball is white. its disk drive is white. its lid is silver. its battery is white. its panel is silver. its leg is white. its screen is [text]. its rubber is white. its switch is white. its hook is white. its base is white. its key is white. its foot is white. there is a white wall behind the desk. there is a giant puddle under the desk. there is a coffee cup -18 inches to the right of the computer. the coffee cup is leaning 66 degrees to the left. coffee wave -7.5 inches to the left of the coffee cup. it is 2 inches tall. it is leaning 88 degrees to the left. it is -4.4 inches above the coffee cup. 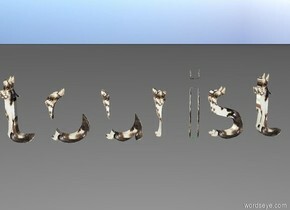 there is a matte [texture] cat -1.2 inches to the left of the computer. it is facing the wave. there is a mouse to the right of the computer. The black cat. The white cat is in front of the black cat. The blue cat is in front of the white cat. 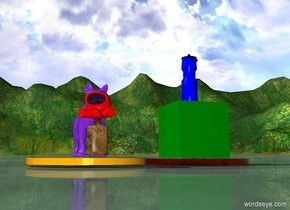 The orange cat is in front of the blue cat. 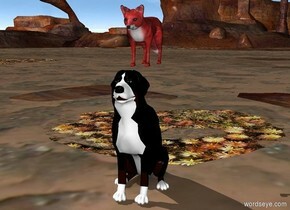 The red cat is in front of the cat. The green cat is behind the black cat. The pink cat is behind the green cat. The purple cat is behind the pink cat. 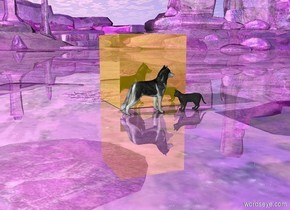 The grey cat is behind the purple cat. The yellow cat is behind the grey cat. The sky is red. The ground is orange. The very small Warriorcat303 is on the right side of the green cat. 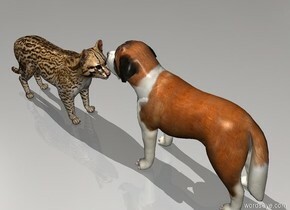 a cat is facing a dog. 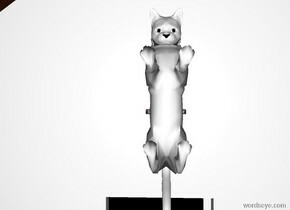 the dog is facing the cat. The cat is on the car. The house is 7 feet behind the cat. The dog is 4 feet left of the house. The sky is blue. 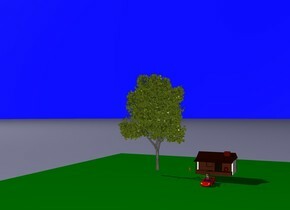 The grass is green.The tree is one feet left of the dog.The flower blossom is in front of the house.The apples are in the tree. 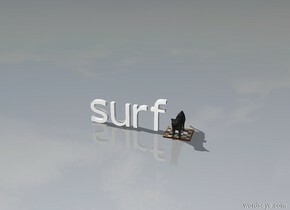 A cat on a surf board. 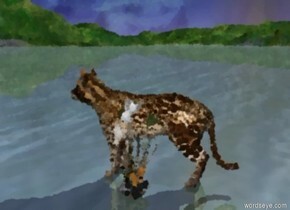 There is a leopard two feet in front of a very big rusty dark gold cage. The leopard is on the ground. The cage is 2.5 feet in the ground. 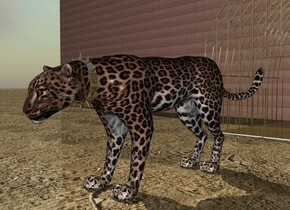 The leopard is one inch in front of the cage. There is a rusty dark gold collar 52 inches in front of the cage. The collar is 12.25 inches in the air. The ground is dirt. There is a dark gold very small floor on the ground. The floor is 2 feet behind the leopard. There is a big rusty copper wall behind the cage. 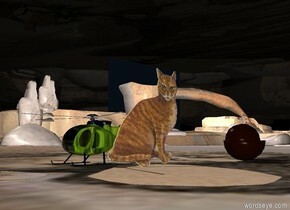 The giant cat is to the right of a melon helicopter. The cat is facing the helicopter. An extremely giant mango is 10 feet behind the cat. The sky is light blue. The ground is desert. 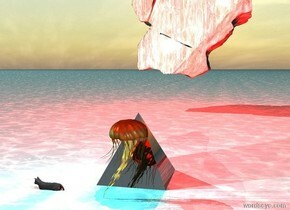 the huge glossy black pyramid is behind the HUGE jellyfish. the house cat is 2 feet to the left of the jellyfish. the house cat is 0.5 feet inside the ground. 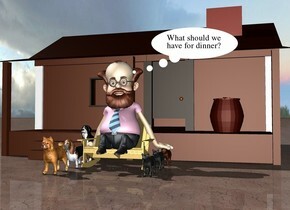 the house cat is facing left. The cyan light is two feet above the house cat. The red light is two feet above the jellyfish. the ground is water. the huge asteroid is 30 feet behind the pyramid. it is 5 feet above the ground. ten new red lights are 2 feet under the huge asteroid. ten new red lights are 3 feet in front of the huge asteroid. 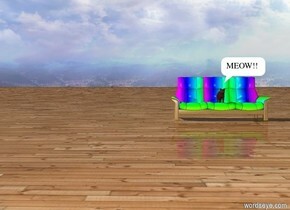 The cat is on a couch. The couch is Rainbow. There is a wood ground. A cat is next to a huge flower. it is night. the volcano is twelve feet tall. the big red light is two feet above the volcano. the orange light is three feet above the volcano. the small yellow light is four feet above the volcano. the rat is 16 feet north of the volcano. the rat is looking at the volcano. the dog is 1 feet west of the rat. the dog is looking at the volcano. the deer is 1 feet east of the rat. 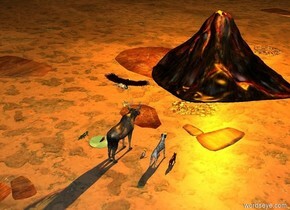 the deer is looking at the volcano. the bird is 2 feet above the deer. the bird is looking at the volcano. the cat is 1 feet west of the dog. the cat is looking at the volcano. the puddle is 1 feet east of the deer. the puddle is on the ground. the fish is 2 inches in the puddle. the fish is looking at the volcano. the fish is leaning 15 degrees to back. the lizard is 2 feet east of the fish. the lizard is looking at the volcano. The ground is grass. The wooden birdhouse is 1 inch in front of the cat. The birdhouse is 2.3 feet tall. 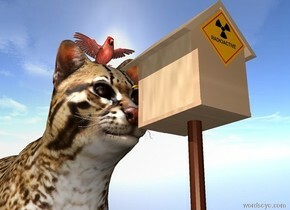 The birdhouse is facing the cat. The bird is -1.75 inch above the cat. The bird is -9 inches in front of the cat. The panel is -3 inches behind the birdhouse. The panel is 3.6 inches wide. The panel is 1.95 feet above the ground. The chicken is on top of the black cat. 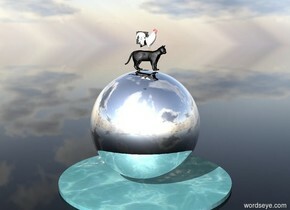 The black cat is on top of a 5 foot tall silver sphere. The ground is made of glass. There is a 8 foot wide pond below the sphere. there are 33 trees. there are 12 skyscrapers 3 feet behind the trees. the sky is sunrise. there are 12 huge trees to the left of the trees. there are 12 huge clocks in the air. 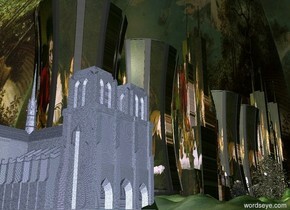 there is a huge cathedral 3 feet in front of skyscraper. the cathedral has a tile texture. there is a bosch church to the left of the cathedral. the skyscrapers have a meat texture. the trees are transparent. A rainbow sphere. There is a huge slice of pizza a foot above the sphere. The sky is black. The ground is transparent. There are stars in the sky. A nebula is in the top left. The large rat is on the pizza. Sunglasses are on the rat. A carpet is behind the pizza. A huge cat is sitting on the carpet. The cat is white. A top hat is on the cat. 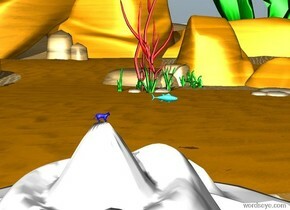 A blue cat is on top of a white mountain. The sky is orange. A fish is in the sky. There is a desk. a large chair is behind the desk. 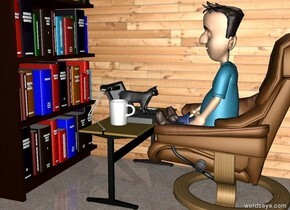 a man is on the large chair. A large computer is on the desk. a cat is on the computer. 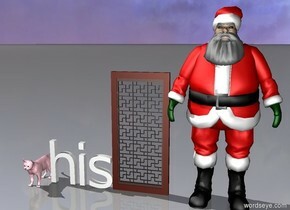 the computer is facing the man. there is a book on the left of the computer. There is a lamp 25 centimeters on the right of the computer. the lamp is facing the computer. there is a large mug on the right of the computer. There is a 100 foot long [texture] wall on the left of the desk. the wall is facing the desk. the ground is carpet. there is a large bookcase 2 feet in front of the desk. the bookcase is facing the desk. There is a couch. The ground is carpet. There is a short woman on the couch. There are 2 white small cats on the couch. There is a cat on the left of the couch. There are 5 small cats in front of the couch. The cat is facing the dog. 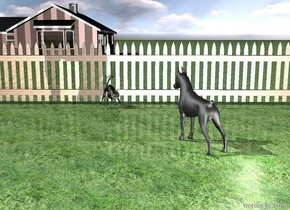 The cat is in front of the extremely long [wood] fence. The cat is in front of fence. The ground is grass. 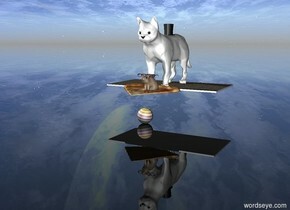 The dog is facing the cat. The dog is 5 feet in front of and 2 feet to the right of the cat. The house is 50 feet behind the fence. The house is 1 foot left of the cat. The house is facing west. The light is in front of and to the right of the dog. Bed. Cat on bed. large Computer in front of cat. computer is on the bed. 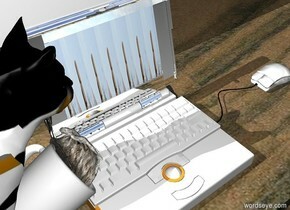 computer is facing the cat. There is a [texture] wall behind the bed. There is a man in front of a house. the man is on the chair. the ground is dirt. 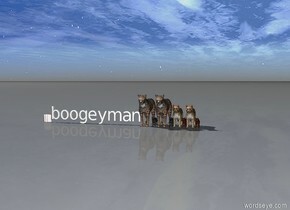 there are 3 dogs next to the chair. there are 3 cats on the right of the chair. A tiny little pink devil is .6 feet in a huge enormous giant red butterfly. The red butterfly is 5 feet above the ground. 1 tiny jesus is on the ground. The tiny jesus is 4.5 feet in front of the devil. 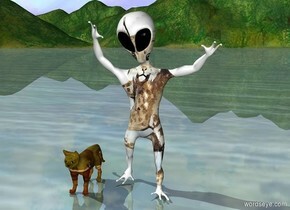 The tiny jesus is facing the devil. The ground is black. A red light faces the devil. The devil is matte. A big small cat is 1.25 feet in front of the tiny jesus. Mario is 1 feet in front of the devil. There are two cats on a couch. there is a table in front of the couch. the table is facing west. large cup on the table. 2nd large cup is next to the cup. large cookie is next to the cup. chocolate cake is next to the cup. the ground is tile. Jiji isn't having a great day. The huge [jiji01] sphere. the ground is clear. 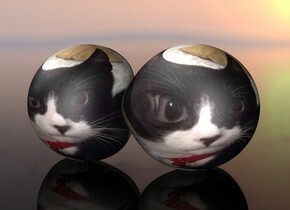 the 2nd huge [jiji01] sphere is next to the [jiji01] sphere.